NASA's hobbled Mars rover Spirit has made its last shortdrives of the season and is now parked for the Martian winter, which missionmanagers hope it will survive. Spirit got stuck in a sand trap on Mars last April and NASA officialsannounced last month that they were putting a halt on the efforts to free thelong-lived rover. Instead, NASA started a newmission for Spirit, one that will use the six-wheeled robot as a stationaryscience outpost. The change for Spirit came after more than six years spentroaming the Martian surface. 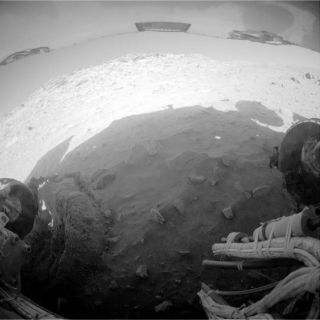 Spirit landed on Mars in January 2004 a few weeks ahead of its twin Opportunity, which is working fine and roving to a giant crater on the other side of Mars. The rover team is commanding Spiritthis week to make additional preparations for the Mars southern hemispherewinter season and doesn't plan to tell the rover to move its wheels again untilspring. "We have hope that Spirit will survive this cold, darkwinter that we have ahead of us and be ready to do more science comespringtime," said Steven Squyres, the rover mission?s principalinvestigator at Cornell University in Ithaca, New York, when NASA announcedSpirit?s stationary plan on Jan. 26. Spirit'slast drive before winter took place on Feb. 8, when the rover changed theangle of its suspension system, but it did not produce a hoped-for improvementto the overall tilt of the solar array for catching winter sunshine. The last set of drives, taken since Jan. 15, have moveSpirit 13 inches (34 cm) to the south-southeast. But the rover hasn?t been able to maximize its tilt to catchas much of the low winter sun's rays as possible during and is left in aposition tilted 9 degrees to the south. Spirit's parking positions for itsprevious three Martian winters tilted northward. Engineers anticipate that, due to the unfavorable tilt forits fourth Martian winter, Spirit will be out of communication with Earth forseveral months. Spirit may enter a low-power hibernationmode within a few weeks, shutting down almost all functions. The rover is expected to keep its master clock running and check its power status periodically until it hasenough power to reawaken. It may go in and out of this mode a few times at thebeginning and at the end of an extended hibernation period. This week the rover team is uploading schedules to Spiritfor when to communicate with Earth or with the orbiting Mars Odyssey during therest of this year and into 2011. Spirit will use these schedules whenever ithas adequate power to wake up. Spirit will take a set of "before" images ofsurroundings from the parked position this week, for comparison with images inthe Martian spring to study effects of wind. Images toward the south will also aid preparations forpossible future drives, although, with only four of its six wheels stillworking, the rover is not expected to move farther than short repositioningdrives. Other preparations for winter will include putting therobotic arm into a position for studies of atmospheric composition when poweris available and changing the stow positions of the high-gain antenna andpanoramic camera to minimize shadowing of the solar panels.